Modulex, the floor standing condensing gas fired boiler is available for both indoor and outdoor installations with unique patented features. The design of the boiler is to maximise efficiency through condensation of the flue gases and to minimise the effects on the enviroment. The combination of premixed radiating combustion with high turn down ratios produces unparalleled efficiency throughout the operating range of the boilers. Modulex EXT are to the forefront of Condensing boilers. Due to the modular design huge flexibility exists. With turn down ratios ranging from 1:39 depending on the model, Modulex is sure to be able to match the varying heat load of the application. Due to the multi-burner design high redudancy exists within a single boiler should any burner fault. In a fault condition the boiler will continue to operate although at reduced output. Noise level of the largest size Modulex does not exceed 50db making them suitable for installation in noise sensitive areas such as Schools, Nursing Homes, Apartments Buildings Etc. The Modulex EXT rangle of boilers may be used alone or in cascade with one or more boilers. Their space saving design, simple service access, the ability to reverse the water and gas connections from right hand side to left hand side and the ability to set the flue connection on three sides makes them flexible enough for installation in almost any locations. Modulex boilers are manufactured of high quality cast Aluminium Silicon which is highly resistant to corrosion and thermal shock, providing longer life time. Aluminium Silicon provides one of most effiicient heat transfer materials, has up to 7 times more thermal co-efficient transfer capacity than stainless steel and is lighter weight. The action of the flue gases and condensate is self-cleaning in the heat exchanger by flowing downwards to the flue way. Modulex boilers apply a dedicated E8 Heating Controller which permits a decisive qualitative leap in boiler management depending on the applied loads. The E8 as well as becoming the window of dialogue with the boiler thanks to its features permits the complete management of the central heating system, exploting the maximum modulating output and the maximum obtainable condensation. Management of the heating system through the E8 Heating Controller has facility to manage two individual heating circuits, a domestic hot water heating system linked with solar and a temperature dependant output releated to ambient conditions. 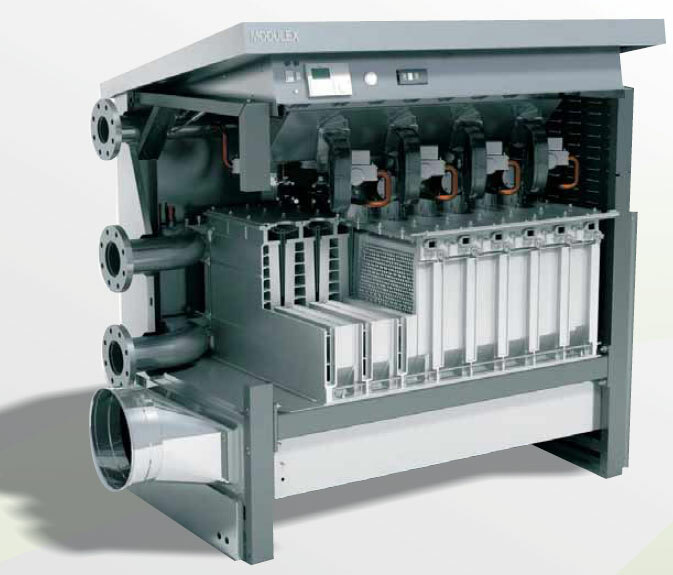 Note: Modulex EXT boilers must be installed with a Hydraulic Separator. Maximum working pressure 800 kpa. Gas Pressure Range 1.1 – 4.0Kpa. (*) the flue connection adaptor 200/250 is included in the boiler delivery.